Any glass containing manganese prior ca. 1915 will turn purple when exposed to the sun or ultraviolet light. After 1915 most, not all glass companies substituted selenium as a clearing agent for glass. Heisey, Duncan & Miller, Fostoria, Cambridge and Imperial glass companies are some exceptions. Glass collectors know this as the purpled glass is quite collectible. Marty is absolutely correct, clear glass will not turn opaque when exposed to the sun. Opaque glass will turn a lavender shade if it contains manganese. marty I will get pictures of the Velvetin skin lightner jar, going to take a couple of weeks but I will put them on this same thread. Though I have to say after reading the list of other companies using this bottle it is disheartening. I wish they all were skin lighteners, if so that glued together bottle would have stronger evidential value to AE's freckles. As I suspected, I think one distributer sold this product to different companies to slap their name on and sell it. Joes subsequent research since the press release did not help strengthen the link to AE. All were facial skin creams, though some companies called it specifically skin lightener, and some called it skin rejeuvenator and some called it freckle cream. Same thing done today in a lot of products on the shelf. Still strange that a facial cream or freckle cream was found, but it sure would have been better if every known example was a mercury containing skin lightener. But the reality is a sun burnt coast guardsman could have bought something called skin food for his aching red face. Joe's subsequent research since the press release did not help strengthen the link to AE. No lab test will ever make that connection. If we stumble across a picture of AE holding a clear glass jar like the one in question, that would help. Or correspondence with a cosmetic manufacturer about a product that came in clear Hazel-Atlas jars of that style. Barring a breakthrough at that level, I think we're left with a very open question about who brought the jar to the Seven Site. It seems more likely to me that the apparently cosmetic materials (broken mirror, rouge, broken U.S. cosmetic jar) argue for an American woman as the source, but it is not an airtight case by any means. I am now of the opinion that this artifact is not associated with AE. Despite the fact I have an identical jar in white. Bummer. Do a quick search on Ebay for ointment jars. heck do a loooooong search on Hazel atlas which has apparently been ongoing for 2 years? You will find white glass, commonly called milkglass. Now this is not just coincidence that clear ones are not showing up. Clear glass in ointment jars were produced in a very narrow time frame in the overall scheme of things. What is overlooked and misinterpreted is a notation in the companies history that Hazel atlas applied for a patent for white glass in 1936. So everyone put two and two and got five and said well a clear jar would be before 1936 but still possibly used by AE. We just have to find that clear jar. What is overlooked is the companies history. They didn't just learn how to produce white glass in 1936. They were producing ointment jars in milk glass by 1920 at least. Go to the Owings Corning glass museum website and find a book by hazel atlas, printed in 1926, 7th EDITION, with a long title starting "Opal ointment jars"... ect. By 1926 certainly Hazel Atlas's ointment jars were white. Like every other company had. This was the largest glass company in the world. They didnt just starting making white glass in 1936! The 1936 patent date is after they started producing plates and housewares and wanted their own form of milk glass, and called it platonite. In 1929, depression starting, sales were down, company was losing money and looking for an edge, they began to move away from clear houseware plates to highly decorative and beautiful forms of colored plates and dishes. Hence we have "depression glass"
That has nothing at all to do with the ointment jars they had been producing since at least 1900. By 1910 every catalog and advertisement you will find lists ponds, colgate, hundreds of facial creams, and every single one of them are in white milk glass jars. Including hazel atlas (who started out remember making WHITE GLASS MASON JAR LID INSERTS.) They then moved on to ketchup bottles and industrial jars like ointment pots. All in "opal" , MEANING WHITE. This was all in the early 1900's, a good estimate would be 1905-1910 they really started cranking out white ointment pots for any company that would place an order. By 1920 at the latest, hazel atlas produced their own catalog of white ointment pots for sale. A Big huge book of Ointment jar styles in WHITE. Not clear. White. That book is on Microfilm at Owens Corning. Did Joe have that book while doing his research? Now another nail in the coffin with this found artifact is the different companies that used this same design. The initial press release was fascinating, as Tighar said we have found ONE product that matches this pot. Freckle cream. It went world wide. Front page everywhere. Now of course, there is a backing away from that since there is serious uncertainty over which company even used this jar. A new company using this style jar gets found a lot it seems. So now where are we at? We have an ointment pot that had to be made around 1900-1910. Predating the white milk glass craze everyone used by 1937. It is also guessing whether it ever had Dr.Berrys freckle cream in it at all, as there were several companies that were using this same design. Not just a freckle cream remover. Heck I have a jar that wasn't even on Joe's list of companies that used this same design, how many more were there? Of the companies listed in this thread as using this jar, you will find two of them were early 1900's, small time companies. By 1920 Gervais(sic?) was a lady doctor working from her home and down to selling hair care solution, not even the facial cream she was using back in the early teens. So basically if this jar was associated with AE it SHOULD BE WHITE. By 1937 every ointment and facial jar I have found is white, opaque, blue, but colored not clear. Even the hazel atlas own records has a catalog, a book really,of white ointment jars, not clear ones by 1920. Did joe get the style and model number of this jar, but the guide book did not list the production years and color? So unless AE was using a 1905 jar of Dr.Berrys, there is no way this is hers. I can't imagine my wife using a 30 year old facial cream. I doubt AE did either. I am not happy with this finding, but the more research you do into this jar, the more it looks like a wild goose chase. It's an unknown product produced in a clear glass long since discontinued by 1930. Can we say some shaky evidence? Everyone is looking for a clear Dr.Berrys jar, when they should have been checking to see what color Hazel Atlas was making ointment jars in 1937. It was white. And had been white for a couples of decades. Not clear. This jar is too old. We must remember that the artifact ointment pot had the Hazel Atlas logo on the bottom "which was first used in 1923 according to trademark records quoted by Peterson (400 Trademarks on Glass)". Ricker I think the answer is "maybe"
have an "N", or does it have an H with a dot on top? All those are known varieties. What I have read is it's marked so that Joe could say it was Hazel Atlas. What is the Mark on this glass? Even if it says "HA". Reference material I found said it was used "around" 1920. And different plants may have Embossed different glass at different times. Even with a patent date of 1923. It could have been embossed years before that. So we are back to clear glass being used and probably marked before 1920. Also, again, there were big differences in industrial produced items and household glassware, note white glass was patented in 1936 but HA was producing white glass ointment jars two decades before that. God only knows how each plant manager marked each run especially on industrial useage jars and bottles. What we do know for a fact, is white ointment jars were made for sure by hazel atlas by 1920 almost exclusively. Their own catalog states as much printed in 1926. Why is this one clear if it was supposedly belonging to a woman in 1937? The weight of evidence suggests unless it was a one off bottle, for AE, this is a not a late 1930's ointment jar. And to think Hazel produced a special clear glass ointment jar just for AE, just because it fits the timeframe of 1937, is reaching and making the evidence fit the theory. is a clear flint glass model described as their "leading package" ( probably their simplest cheapest model). 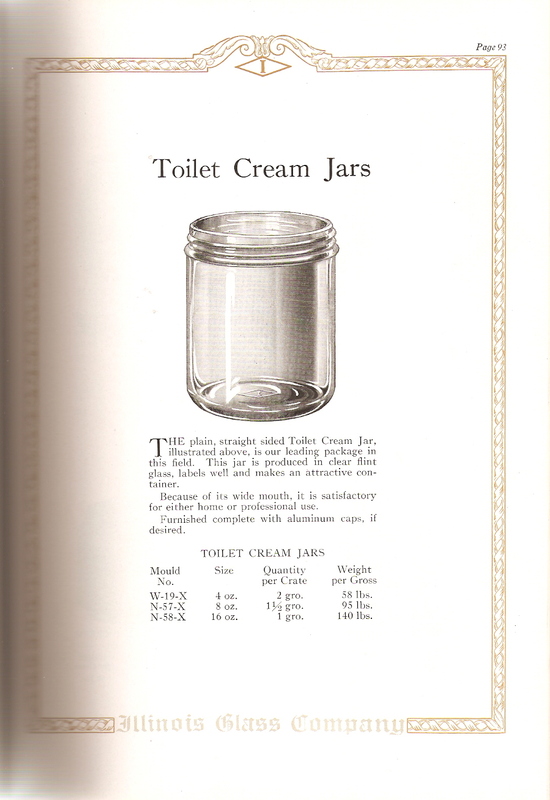 Did the HA catalogue from 1926 say that they had ceased all production of clear glass ointment jars? Certainly other possibilities remain such as companies stockpiling packaging so that they would be selling products in jars that were produced several years previously. All that being said it is troubling that the press release was misleading. In terms of evidence for the presence of AE these fragments from the 7 site are always going to ambiguous, too much chance for both pre and post 1937 contamination, narrowing it down to a woman's product manufactured in the 1930s would make it somewhat more relevant but still would not convince anyone who did not already assume AE and FN had been on Niku. Or, maybe it happened like this. During the transition from clear to white glass, H.A. is stuck with a warehouse of clear #1955 jars. Doc Berry needs to place an order for more #1955 jars. H.A.s' sales Rep. tells the Doc he has a bunch of the old clear #1955's and makes her a heck of a deal. She buy them and makes a "one off" run of the freckle cream in clear jars. AE buys a new jar of the Doc's freckle cream in the clear jar for the trip and it winds up at the beach party on Gardner. So the run becomes a financial "one off" verses one for AE's celebrity. As far-fetched as this may sound, you gotta' think in post depression terms. A buck was a buck, and good deal would have been a great motivator for a transaction like this in the years following. Just as it is in todays financial climate. And Dave, don't let patent dates and production dates frustrate you. While they can be similarly tied they are two different trains being driven by two totally different engines. Do we have any direct evidence apart from the fact Amelia Earhart once mentioned her freckles at a publicity photo shoot that she was carrying freckle cream? I'd like to answer that but I'm ignoring you! Yesterday afternoon, while I was doing my research on this very very disputive clear jar found on the island...I found out, like Mr. Burrell has that Pond's had white milkglass jars as far back as 1911. Now, I don't understand why Hazel-Atlas would apply for a patent on milkglass component Platonite, when milk-glass was already being made! But, like someone has mentioned Dave Burrell that the jar indeed had the trademark stamped on the bottom of the jar. So, we have to say that this is the product that was made for this jar with all the scientific studies done so far. As for Joe...I think Joe has done a wonderful job on all the scientific studies and long research done to find this particular jar that we seek. I don't think the man is rushing to conclusions and picking jars out of the air as we speak! Anyway, this jar fits the freckle cream box perfectly, has the hazel-atlas stamp on the bottom, and is white, has traces of mercury on it. Seems like its a match to me!!! It seems to me that the opinion stated in Reply 108 that "this jar is too old" is supported by the fact that in 1936 the Dr. Berry's product was sold in jars completely unlike the artifact jar, see the '36-'37 Fall/Winter Sears catalog page. [About halfway down the page, to the left.] Not to spoil an objective post with (worthless) personal opinion, but the "streamlined" container shown there looks much more appropriate to the 1930's; the artifact jar and the other ornate Dr. Berry's jars and boxes collected by TIGHAR have a much more turn-of-the-century appearance. 1) If everyone here already knew this, or the post is otherwise dumb, I'm sure you'll let me know. 2) If the contrary, I deserve no credit. The original find appeared on another person's blog that is not related to AE. I am not linking directly to that blog as the owner may not wish to have his/her server swamped and/or receive a wave of unexpected comments. Randy nobody said it wasnt a hazel atlas jar. If it has the mark, it has the mark. And it may fit a Dr.Berrys box. I have a Velvetine Hazel atlas jar that will fit as well. Same jar, but in milk glass. Also, I explained why platonite was patented in 1936. That was for plates and dinnerware. with other colors, such as red stripes, for decorations. The point being, as you found, milk glass was THE predominant glass color by at least 1900 for ointment jars. It's hard to find a clear one made between 1900 to 1950. Clear ointment pots generally show up in catalogs in the 1890 to 1900 time frame. Milk glass was so common, as early as 1905, that Hazel atlas, in their own catalog of Ointment jars titles their book " Opal ointment jars..."
That was from a catalog in 1926. And apparenty opal glass was used long before then since the Hazel book I found made in 1926 was the 7th printing! They don't have a book listing clear ointment jars. Now it matters not whether another company used clear glass for their ointment jars. The fact of the matter, is that Hazel, our examples company, had pretty much phased out clear ointment jars years before AE's flight. I cannot say for certain a run or two did not happen with clear glass. But given it's been two years of research to locate one print ad from the 1930's showing a clear ointment jar from HA, I would say the odds are great few clear ointment jars were produced in the 1930's from this company. Therefore, a clear ointment jar from Hazel Atlas points to an earlier manufacture date, most likely before 1920 and probably a decade or more earlier than that. Meaning the found jar was much older than the 1937 flight. So the jar doesn't fit, this "evidence" you must acquit.